Extracts URLs from an Issuecrawler result file (.xml). 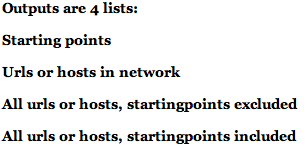 Useful for retrieving starting points as well as a clean list of the actors in the network. The Extract URLs module is built into the Issuecrawler, on the network details page. 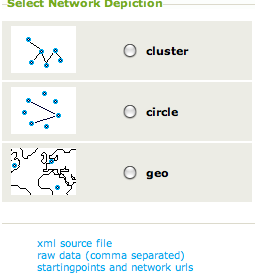 By clicking 'starting points and network URLs', the seed URLs as well as the URLs in the network are shown. It produces clean lists of URLs, and is useful for relaunching crawls, editing seed lists for a new crawl as well as displaying the URL lists of the actors in a network. Click starting points and network URLs.